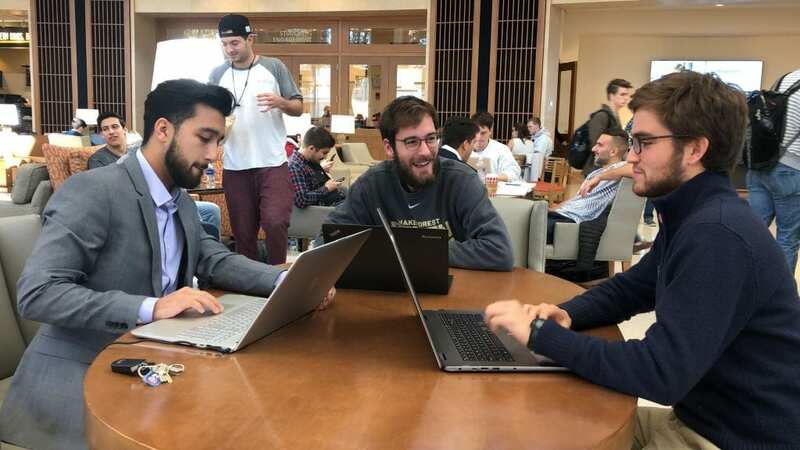 What do you get when you combine three Wake Forest School of Business students who share a passion for sports and data? A new game-changing tool for Wake Forest football. Using descriptive analytics and applying what they are learning in the Master of Science in Business Analytics program, Muhammad Ammar (MSBA ’19), Andrew Bowers (MSBA ’19), and Sebastian Fischbach (BS ’18, MSBA ’19) developed a tool to assist Associate Athletic Director of Communication Steve Shutt and his team’s efforts to enhance the game experience. It was while watching a TED Talk during class that sparked an idea to go for the extra yardage. “The speaker was talking about how they use predictive analytics in basketball and the software they developed around that,” explains Fischbach. Ammar and Fischbach were eager to get started but needed another player to round out the team. Sebastian recalled meeting Andrew Bowers during MSBA orientation. He majored in data analytics and statistics at Virginia Tech and had recently attended the MIT Sloan Sports Analytics Conference. He was a natural fit to round out the team. The only challenge? The MSBA class is split into sections. Ammar and Fischbach were in one section while Bowers was in another. It would require excellent communication and project management skills to ensure success. With the team assembled, the students searched for a project. Sebastian, who runs cross-country and track and field for the Demon Deacons, leveraged his network within the athletics department to approach Associate Athletic Director Steve Shutt with a proposal. It was a pitch Shutt had heard before. The task was a daunting one. In the 12 years Shutt has been at Wake, the athletics communications team has conducted a lot of football statistical research. “We’ve been trying to put together all the statistics from every football game that Wake has ever played in going back to 1888,” he added. Statistics are crucial to the game experience and the communications team’s interactions with the broadcast announcers and the media. “When you hear the announcer on television say ‘this is the first time this has happened against this opponent in 80-plus degree weather’ or just something a little bit absurd but actually really cool, that’s what Steve wants to know,” explains Bowers. The challenge for the MSBA students was taking the data and streamlining to be more reliable and easier to pull during the game. “Steve is a powerhouse of statistics, but the way he gets them is he looks at a bunch of different Excel spreadsheets that he has kept throughout the years,” added Ammar. Their first action was tackling the messy data. The students moved away from the visually formatted spreadsheets that were customized for Steve to a format where a statistical software program like R could read it. A website now allows the team to query vast amount of statistics on the football program, saving time and putting the athletics communications team on the cutting-edge of providing information to the broadcast announcers and sports media. During home football games, Ammar, Bowers, and Fischbach sit in the press box with Steve and assist with queries based on what is happening on the field. The experience gives the students an opportunity to apply the platform in a real-life situation and refine it as needed. “We’re live coding in the press box, which is really interesting. It’s the first time I’ve ever coded at a football game. It’s just straight work for the 60 minutes they are on the field,” describes Bowers. Taking on an extracurricular project of this magnitude while enrolled in the 10-month MSBA program has required the students to become masters at time management. The students recognize it will benefit them in the future. “In the real world, we’ll have a lot of different tasks that we’re trying to balance. The trick will be prioritizing these projects with our time and understanding what’s due when. This project really helps with that,” explains Ammar. They’ve also benefited from applying what they are learning in the classroom to a real-world situation. One of the hallmarks of the School’s MSBA program is arming students with not only the technical skills needed to analyze data but the presentation skills to help with storytelling. “We learned technical parts throughout our classes that we try to implement to our project, but we also learn softer skills such as project management and presentation skills,” added Ammar. With the football season drawing to a close, the team has transferred the final project to Shutt. They remain available to assist as needed. Their next play? Searching for ways to customize the program for other sports applications at Wake Forest and beyond. Aleasha Vuncannon is a strategic communications and public relations professional based in Asheboro, N.C.